Based on the report of an inquiry conducted by Virginia Commonwealth University (VCU), the willingness of the Respondent to settle this matter, and analysis conducted by ORI in its oversight review, ORI found that Dr. Girija Dasmahapatra, former Instructor, Department of Internal Medicine, VCU, engaged in research misconduct in research supported by National Cancer Institute (NCI), National Institutes of Health (NIH), grants R01 CA063753, R01 CA093738, and R01 CA100866. Steven Grant declined to comment. As soon as we were made aware of potential irregularities in the manuscripts’ figures, per VCU policy, we launched an internal inquiry that led to an investigation. The federal Office of Research Integrity was notified, also per our policy, and assisted with the forensic analysis of many of the figures. In the course of the investigation, the former research instructor, Dr. Girija Dasmahapatra, admitted responsibility, which lead to a Voluntary Exclusion Agreement between him and the ORI. Dasmahapatra left the university in July of this year. The laboratory in which he worked has taken steps to prevent these kinds of errors from occurring again, and journals where the manuscripts were published are being contacted in order to take the necessary editorial actions. Dasmahapatra’s LinkedIn page appears to be outdated — it still lists him as an instructor at VCU. We have found contact information for an instructor by the same name who works at a community college, but have not confirmed that this is the same researcher. We will update this post with anything else we learn. The VCU Office of Research Integrity and Ethics received an email in December 2014 from an anonymous source that alerted us to the matter, after which we launched an internal inquiry. “Steven Grant declined to comment.” As the supervisor, surely Dr. Grant must also be held responsible? When a manuscript is submitted to a journal, it is implicit that all authors have seen, and approved, of the content for publication. An institutional investigation and an ORI report within a year is much more like it. Well done! Wow. 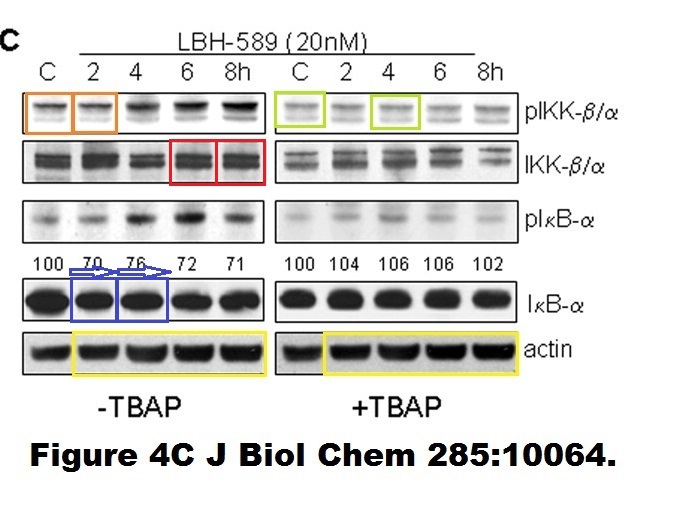 All of the teeny tiny error bars atop all of the barplots in the BHJ paper “The Bruton tyrosine kinase (BTK) inhibitor PCI-32765 . . .” are another tell that things need much vetting in this set of papers. When images are concocted, as now proven for this paper, what data was there from which to even construct means and standard errors? Full bodies of data need to be shown, and verified against original source material, whenever image manipulation is uncovered. Kudos to those who posted PubPeer entries documenting all the image manipulation, and to the ORI and VCU for working through this issue in such a relatively timely fashion. In this kind of case, the PI should be punished equally. How are co-authors who might truly be innocent, shielded from the shrapnel effect of this explosive finding, especially those that remain in science? That could be your job. Kudos to VCU for actually doing something on the basis of an anonymous tip, rather than simply ignoring it as many other places seem to do. And kudos to the anonymous tipster. This is disgusting in any case, but the fact that fraud has been perpetrated by this guy at least 11 times and in studies that might be precursors to chemo combination trials in patients is really disturbing. He must’ve had a lot of free time on his hands if he was just regurgitating/recycling the same old fraudulent data over and over. “The laboratory in which he worked has taken steps to prevent these kinds of errors from occurring again.” My (hopelessly naive) question is: why weren’t these steps already in place if indeed they could have stopped this from occurring? Probably because you cannot prevent something that you do not know, or imagine, may happen. I agree with Paul Brookes. The action taken by the VCU Office is unfortunately NOT usual practice. There are many other similar cases where the research institution simply ignore anonymous tips, even if the case is clear cut and involving many published papers. I am surprised by why these investigations are not publicly known in the US. We had a similar case in my country where the whole case was discussed in media after the home institution presented the case officially and informed the media regarding the details in the case. Openness in these cases is very important and will help to prevent misconduct in the long run. So presumably the VCU ORI is also aware of the PB Fisher concerns. Lets hope for a similarly speedy resolution. Yes, VCU informed about a year ago. H Boukerche, has had had a 2015 paper retracted. Second of 2 retractions reported below. If indeed the same guy who committed this egregious, repeat-offender fraud is indeed working at a community college in Richmond (which is a possibility given the exact same name), I find that to be insulting that he’s taking up a job that someone with solid (and ethical) credentials could otherwise fill. Secondarily, he’s teaching students, and while no one can jump to conclusion that perhaps he’s superimposing his own set of flawed ethics onto the teaching or the distribution of grades in his class, his history of at least 11 ethical violations is concerning and disturbing. I do not see the name Girija Dasmahapatra on this paper. J Biol Chem. 2010 Mar 26;285(13):10064-77. doi: 10.1074/jbc.M109.095208. Epub 2010 Jan 11. Histone deacetylase inhibitors activate NF-kappaB in human leukemia cells through an ATM/NEMO-related pathway. Rosato RR1, Kolla SS, Hock SK, Almenara JA, Patel A, Amin S, Atadja P, Fisher PB, Dent P, Grant S.
1Department of Medicine, Virginia Commonwealth University, Richmond, Virginia 23298, USA. 2016 retraction of 2010 Steven Grant paper which does not have Girija Dasmahapatra on it. This article has been withdrawn by the authors. The image used to represent U937 cells treated without TBAP for 4 h in Fig. 4A was reused to represent U937/3.1EV cells treated with LBH for 4 h in Fig. 7B. In Fig. 4C, lanes 1 and 2 of the left pIKK-β/α panel were duplicated, lanes 1 and 3 of the right pIKK-β/α panel were duplicated, lanes 4 and5 of the left IKK-β/α panel were duplicated, and lanes 2–5 of the left actin panel were duplicated in lanes 2–5 of the right actin panel. The actin immunoblot in Fig. 6A was reused as the actin immunoblot in Fig. 7A. Part of the actin panels in Fig. 4C was reused as actin in Fig. 6B. In Fig. 6B, lanes 1 and 2 of the left actin panel were duplicated inlanes 2 and 3 of the right actin panel. In supplemental Fig. 1A, lane 3 of the actin immunoblot from Jurkat cells was reused as lane 1 of the actin immunoblot from HL-60 cells. In supplemental Fig. 3A, lanes 1 and 2 of the TRAF2 immunoblot were duplicated. The actin immunoblot from supplemental Fig. 4B was reused as the actin immunoblot in supplemental Fig. 5B. that the following publications will be retracted or corrected: Blood 2006, Blood 2010, BJH 2013, CBT 2009, CCR 2007, Leuk 2005, LR 2006, MCT 2011, MCT 2012, MCT 2014, and MP 2006. After three years, the Blood 2006 paper remains unchanged, with not even an Expression of Concern to warn the readers that the data were faked. They continue to accrue citations, so presumably people are using their faked results as a basis for their own research. When everyone involved has agreed that the papers need to be “retracted or corrected”, why the inaction? Previous Previous post: We’re wasting a lot of research funding using the wrong cell lines. Here’s one thing we can do.